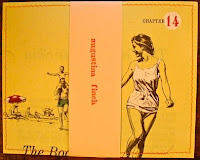 Augustina Finch is the creative endeavor of Samuel & Hanna Robertson. Like those on a faraway excavation, this duo scrapes, sifts & sorts through the archeology of paper to unearth stories to be retold in frames, folds & forms. Their products are essentially a collection of hand-sewn vintage paper envelopes & greeting cards that are made from the pages of old discarded books & magazines. Each unique & one-of-a-kind set of five is handsomely packaged, stamped & individually numbered by hand. There's such a wide assortment of images that there's surely something for everyone. This husband & wife team also makes up the Portland-based indie folk-pop band called The Woodlands. Their debut album has received international praise, press & film placement. Receive a free download of the song "Summerland" when you sign up for The Woodlands newsletter. *GIVEAWAY - Closed - Congrats Very Married! 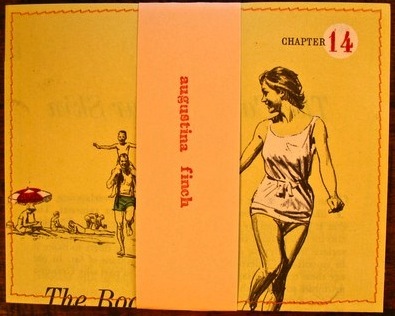 Augustina Finch is giving away a set of five envelopes & cards. To enter, visit their Etsy shop & leave a comment noting your favorite set. For an additional entry, "like" The Woodlands on Facebook, then leave a comment on this post noting you have done so. Giveaway ends at 9pm EST, Saturday, January 15. Please leave a valid email address so I may contact the winner! Also, I've "liked" The Woodlands on Facebook...my name is Jess Milewski. Best of luck with everything! Thanks for the opportunity to win this! I love the set E-075! I love Hand-Sewn Vintage Paper Envelopes With Cards (E-016)!! they're so amazing and so pretty!! Gosh, the sets are all so cute, but I like this one best http://www.etsy.com/listing/60107354/hand-sewn-vintage-paper-envelopes-with ! I like the E-077 set the best. I like the E-047 but they are all pretty unusual and cool. I love set E-077 with the leaves! My favorite item in the collection is E-081. It has a vintage botanical theme that I think is rather charming. I "liked" The Woodlands on facebook. Hand-Sewn Vintage Paper Envelopes With Cards (E-073) are my favorite! I love sets E101 and E009! My favorites are the E-095 set! So beautiful. I love the scenes in E-026. Thanks for the great giveaway! this is my favorite - it reminds me of my great grandpa. My fave is the E-079 set! I hope the giveaway is international :). I really like the one with a cardinal! I really loved the set E-085 - but they are all wonderful! I like the E-008 - with the butterfly. All sets are really fun, though. They are all so pretty! I love the E-077, with the leaves. i love e-052 - the map! My favorite is food/cookbook set (E-024). Thanks! it's really unique and plus it has handsewn parts! I love the Hand-Sewn Vintage Paper Envelopes With Cards (E-095)! The artwork is just gorgeous. I think sending physical greeting cards are a must, especially as thank-yous. I would definitely use these! I like these, http://www.etsy.com/listing/60118483/hand-sewn-vintage-paper-envelopes-with, E-097 and http://www.etsy.com/listing/60116864/hand-sewn-vintage-paper-envelopes-with, E- 095. They are both so cute I couldn't choose just one. lol. Like The Woodlands on FB.